The Cardinals acquired Jose Oquendo with the notion he would become the eventual replacement for Ozzie Smith at shortstop. Instead, Oquendo became their second baseman and paired with Smith in forming a quality keystone combination for St. Louis. On April 2, 1985, the Cardinals got Oquendo from the Mets in the first trade engineered by Dal Maxvill, who had become St. Louis general manager two months earlier. Maxvill knew what it took to play shortstop, having been the starter for the Cardinals at that position on pennant-winning clubs in 1967 and 1968. Like Maxvill, Smith was a Gold Glove Award winner. Like Maxvill in 1967, Smith helped the 1982 Cardinals to a pennant and World Series title. The Cardinals wanted Smith to remain their shortstop. He was eligible to become a free agent, though, after the 1985 season. If Smith and the Cardinals were unable to negotiate a contract extension, Maxvill was prepared to trade him. “If we can’t sign him, there’s got to be some thought about trading him,” said Fred Kuhlmann, Cardinals chief operating officer. The Cardinals, though, had no suitable replacement for Smith. That’s when Maxvill went to work. The Cardinals dealt shortstop Angel Salazar, whom they had acquired from the Expos three months earlier, and minor-league pitcher John Young to the Mets for Oquendo and minor-league pitcher Mark Davis. Four days later, April 6, 1985, the Cardinals got veteran shortstop Ivan De Jesus and reliever Bill Campbell from the Phillies for reliever Dave Rucker. Maxvill saw De Jesus, 32, as the stopgap and Oquendo, 21, as the long-term answer at shortstop if Smith was traded or became injured. Oquendo was 15 when he signed with the Mets as an amateur free agent in 1979 and made his professional debut that year with their Class A affiliate, the Grays Harbor Loggers of Aberdeen, Wash., in the Northwest League. He made 40 errors in 63 games at shortstop that season. Four years later, Oquendo, 19, became the starting shortstop for the 1983 Mets under manager George Bamberger. By April 1985, though, the Mets were managed by Davey Johnson. He saw Rafael Santana, a former Cardinal, and Ron Gardenhire as shortstop options. The Cardinals assigned Oquendo to Class AAA Louisville. “You can look for the Wizard to pack his bags any day now,” Bill Conlin, a columnist for The Sporting News, wrote of Smith after the Cardinals got Oquendo and De Jesus. Instead, on April 15, hours before the Cardinals played their 1985 home opener that night against the Expos, Smith agreed to a four-year contract extension to remain with St. Louis. The deal was worth $8.7 million. Smith received a $700,000 signing bonus and salaries of $1.8 million a year in 1986 and 1987 and $2.2 million a year in 1988 and 1989, The Sporting News reported. Also, the Cardinals provided Smith a $500,000 loan at 10 percent interest and Anheuser-Busch promised him consideration for a wholesale beer distributorship. Smith would play for the Cardinals through the 1996 season before retiring. Oquendo spent the 1985 season with Louisville. His manager was Jim Fregosi, who had been an all-star shortstop with the Angels. Oquendo hit .211 in 133 games for Louisville and made 23 errors at shortstop. In 1986, Oquendo stuck with the Cardinals as a backup to Smith at shortstop and to Tommy Herr at second base. He hit .297 in 76 games, establishing himself as a valuable utility player. 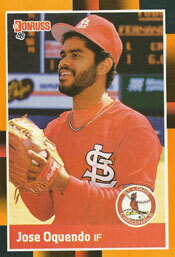 After Herr was traded to the Twins in 1988, Oquendo became the Cardinals’ starter in 1989. He led National League second basemen in fielding percentage in 1989 (.994) and 1990 (.996). In 10 seasons with the Cardinals (1986-1995), Oquendo hit .264 with an on-base percentage of .359. In 1989, he was eighth in the NL in batting at .291. A Cardinals instructor in 1997 and a minor-league manager in 1998, Oquendo was a big-league coach for St. Louis under managers Tony La Russa and Mike Matheny each year from 1999 through 2015. After two years (2016-17) as an instructor at the Cardinals’ training facility in Jupiter, Fla., Oquendo returned to the major-league coaching staff for 2018.